If you float the lower Clark Fork River in the fall, you will see Mahogany Mayflies. One of the last good hatches of the year, they are a staple of the river. They don’t come in swarms like Tricos, or mad splashes like the Skwala’s, but they are consistent producers of fine fall action. I don’t claim to be the author of this fly, although I can’t find a specific reference for it. I’ve been using it for 8-9 years with good results. It’s heritage comes, of course, from the thorax style of Vince Marinaro. The coloration from Mike Lawson’s Mahogany Thorax Dun. I simply added a biot body. Is it more effective than the dubbed body? It is for me. Your mileage may (and probably will) vary. The biot adds to the tying time without doubt. But as I’ve said before, I don’t tie for speed; I tie for fun. And although this isn’t the toughest fly, it will catch a lot of fish before you retire it. A few tying notes. The traditional wing on a thorax dun is made from turkey flats. Does a fish care? I think not. Google “thorax dun” and you will find flies with poly yarn, CDC, snowshoe rabbit foot, hackle tips and anything else you can think of. This tells me that the wing is for the fisherman, not the fish. This fisherman prefers the look of the turkey flat. Tie it any way you like. Another feature of the traditional thorax dun is the tail. It is tilted up by a dubbing ball and split. I tie it with the tilt, but use a fan tail. A silly little bias of mine. 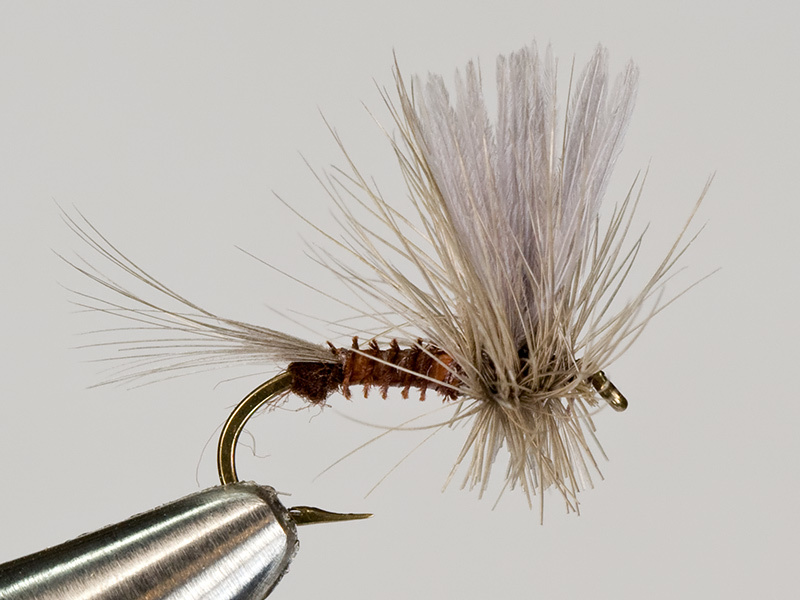 I know mayflies have split tails, but since I like the fanned tail, that’s how I tie it. Hackle tail, micro fibbets, crinkled zelon shuck, on your fly tie it your way. In fact, tie it all different ways and make your own choice. After tying the fly, the traditional pattern trims the hackle even with the hook point to settle the fly lower in the film. I tend to trim them about half way between the hook point and the body. On a fishing note, this is a flat water fly. The low silhouette gives a realistic appearance, but this fly won’t stay up well in riffles and pocket water. But the Clark Fork in the fall is mirror smooth. Those big Cutts and Bows are sipping, not slashing and this is the perfect fly to bring some to the side of your pontoon boat for a brief visit. For step by step instructions and photos, click here.